Sending, managing and analysing your bulk emailing just got a whole lot easier and available online 24/7, 365 days a year. You can create your email designs using your favourite tools and then import them into your account with the click of a mouse. You can easily turn any email design into a simple, re-usable template for future emailing. We don't impose any design restrictions, and you won't find any ugly 'powered by' logos or branding either. What you do get is all your campaign images hosted at no additional cost. Don't feel creative? We can build your email templates for you so you can concentrate on what you want to say. Testing your design in all the different email clients is the most frustrating part of sending email campaigns, either because it is a very time consuming process or because most people do not have the resources to test every email client and SPAM filtering software. Our design and spam testing tool changes all that by doing the hard work for you. Send free tests to any address you like, or for a small fee (and a single click) see your email as it appears in over 20 different email clients like Lotus Notes, Hotmail, Outlook 2007 and AOL. After all, why send emails that cannot be read? We automatically handle all new signups, unsubscribes, bounces and even spam complaints for you behind the scenes. Keep on the right side of spam laws without having to think about it. Every email you send includes a single-click unsubscribe link and our preference centre feature lets your subscribers manage their own subscription. We handle the ugly side so you can focus on what you do best. You can create as many different lists as you need. You only need to pay when sending a campaign, so list management is free. Better still, you can completely customize the signup and unsubscribe process for each list. Copy and paste the signup code, set your own landing page for new signups and send your own welcome emails when they confirm their subscription. 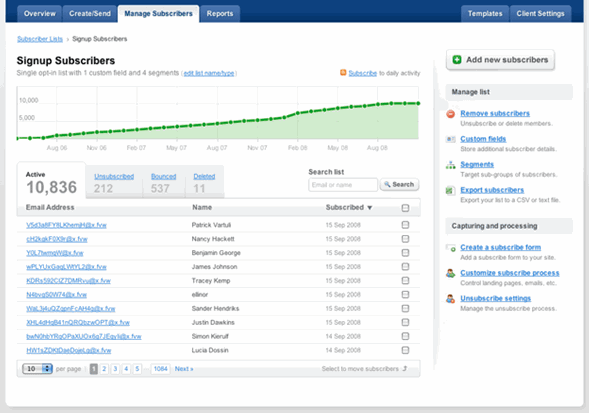 You can easily extend your lists to capture anything and everything about your subscribers. Whether it's address, phone number or favourite car. Not only that, but you can easily personalize your emails with any of the custom data you've captured. Want to get even fancier? You can build segments in your list that target a specific type of subscriber. These can be based on any subscriber demographics you've captured as well as past campaign activity, such as only those subscribers that opened the last 3 emails or clicked a specific link. We provide a comprehensive set of real-time reports allowing you to accurately measure the effectiveness of every campaign you send. Go beyond opened emails and clicking links and measure your campaign related sales, conversions and ROI. The moment your campaign is sent you have access to a range of reports that show you exactly how your subscribers are interacting with it. See who is opening it, what parts of the campaign they are interested in, who forwarded it on to a friend, unsubscribed, bounced out or even marked it as spam. You can even view the geographical spread of your subscribers on a realtime map. Our reporting makes it easy to zoom right down to the subscriber level and see a timeline of exactly what they did with your email. All this and more is at your fingertips for every subscriber in your account and is updated in real-time. Statistics like open and click rates are useful for each campaign, but it's when you start comparing results over time the data really shines. By looking at trends, our compare campaigns report makes it easy to see exactly what is and isn't working in the emails you send. By comparing stats like opens, clicks, bounces, unsubscribes and even spam complaints, you can quickly see what content your subscribers find relevant, and just as importantly, what they don't. Add Tweeter and Facebook like buttons to your campaigns and get realtime statistics on the results. We submit your webite to around 150,000 search engines around the globe including Google, Yahoo, Alta Vista and many more. We update our database constantly with all of the latest Search Engines and submit your website at just the right frequency in order to refresh your content and create fresh inbound links (backlinks) to your site. Effective and comprehensive search engine optimisation designed to give your website the competitive edge. Before spending any budget on marketing it is essential your website (which is typically where you close business) is up to the job, otherwise you risk reducing your audience and limiting your conversion rates. Our pay-per-click management targets the right people with compelling advertisments that when clicked take them to the right landing page which has been designed to maximise conversion rates. Professional advertisement design for magazines and flyers. We design 48 or 96 sheet billboards. If you are looking to make an impact in your outdoor marketing, contact us.